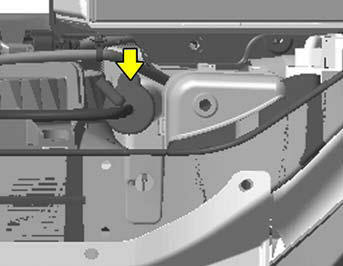 The coolant level can be seen on the side of the plastic coolant reservoir. 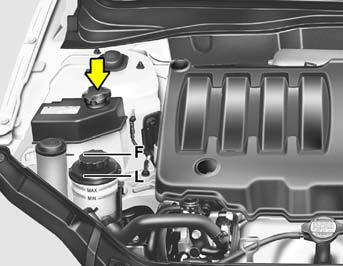 The level of the coolant should be between the "L" and "F" lines on the reservoir when the engine is cool. If the level is below the "L" mark, add engine coolant to bring it up between "L" and "F". If the level is low, inspect for coolant leaks and recheck the fluid level frequently. If the level drops again, visit your Hyundai dealer for an inspection and diagnosis of the reason. o Engine coolant can damage the finish of your car. If you spill engine coolant on the car, wash it off thoroughly with clean water. o The engine in your vehicle has aluminum engine parts and must be protected by an ethylene-glycol base coolant to prevent corrosion and freezing. Do not use hard water. Hard water can cause engine damage from corrosion, overheating or freezing. The cooling fan is controlled by engine coolant temperature and may sometimes operate even when the engine is not running. Use extreme caution when working near the blades of the cooling fan so that you are not injured by a rotating fan blade. As the engine coolant temperature decreases, the fan will automatically shut off. This is a normal condition.